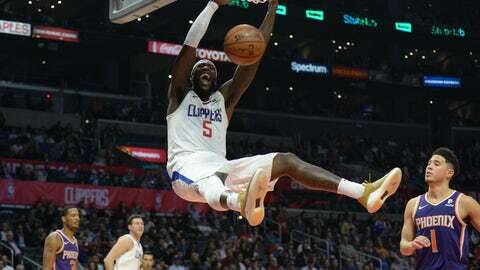 SACRAMENTO, Calif. (AP) — Tobias Harris scored 28 points, Montrezl Harrell added 24 and the Los Angeles Clippers beat the Sacramento Kings 133-121 on Thursday night. Kings coach Dave Joerger faced questions before the game about problems between he and the team’s front office after The Athletic reported that Joerger asked assistant general manager Brandon Williams to leave the team’s shootaround earlier Thursday. It comes less than two weeks after a report by Yahoo Sports suggesting that Joerger was in trouble with management over his handling of the team’s younger players, specifically Bagley, the second overall pick who has come off the bench in all 21 games this season. The Kings held together pretty well against Los Angeles before Harris and Harrell helped the Clippers pull away in the fourth quarter. After Bogdanovic’s layup cut the Clippers’ lead to 112-108, Harris and Harrell combined for 11 consecutive points including a pair of three-point plays by Harrell. The teams exchanged 42-point quarters in the first half. Los Angeles led by 18 in the first quarter but Sacramento went on three big runs in the second quarter and closed within 71-68 at halftime. Clippers: Los Angeles hasn’t lost in Sacramento since March 19, 2013. . Martin Gortat had nine points in 18 minutes after getting into early foul trouble. Gortat picked up his third foul with five minutes left in the first half. . Los Angeles shot 68 percent (17 of 25) in the first quarter. Kings: Bagley left the game in the fourth quarter with back tightness. . The 42 points scored by Los Angeles matches the most allowed in a single quarter by Sacramento this season. Clippers: Play at Dallas on Sunday. Kings: Host Indiana on Saturday.